Electric Race News: Why does racing have to be noisy? Is the noise obnoxious or enjoyable? Why does racing have to be noisy? Is the noise obnoxious or enjoyable? Here's an observation that often comes up at the electric races I attend: Isn't it nice to be able to have a conversation while a race is going on? For many, racing is not just the speed, it's the noise, the smell of burnt fuel, or burnt rubber, the unhealthy food, etc. To each their own really, but the noise is one of the obvious differences between gasoline-powered and electricity-powered racing. In some cases gasoline-powered racing really plays up the noise and other aspects of using flammable explosive liquids to power their machines. I recall seeing one video of a race car with banks of tailpipes along each side of the car, and those pipes were literally belching fire as the driver cranked the accelerator pedal. We have decades now of cultural experience saying that race vehicles are loud, they belch fumes, and often belch fire. Oh, and if they crash, race vehicles often catch fire. In some circles the noise is called noise pollution, and the fumes are called air pollution. Other people outside the racing community want both to be reduced. For example, the common complaint about off-road vehicle enthusiasts is the noise diminishing the feeling of tranquility many seek in the wilderness. In the video you can also hear sounds that would have been drowned out had these been gas bikes, such as noises from the paint-ball field next door. How many race tracks have neighbors who complain about the noise, and have instituted noise restrictions on the track? Well, you might think someone who moves in next door to a race track might expect some noise, but this does happen. Laguna Seca Raceway has rich neighbors who have forced the track to put in noise restrictions, and limit the schedule of major events every year. Most race tracks have to be located way out in the country to avoid noise complaints. But let's get back to the noise from the machines. Isn't noise a byproduct of inefficiency? Heat is a byproduct of inefficiency, and I believe noise is as well. Therefore - the petroleum-powered race machines are very inefficient because they're noisy as heck, and get extremely hot, right? Therefore, by celebrating noisy race machines, aren't the fans celebrating inefficiency? Inefficiency means that more fuel is burned than is necessary, and when the fans turn around and buy their high speed whatever with loud pipes they're just continuing the trend of inefficiency. Right? A byproduct of electrification in motorsports will be that they can locate their activities next to regular civilization, and there won't be noise pollution complaints. Maybe the tracks could be located inside city boundaries. 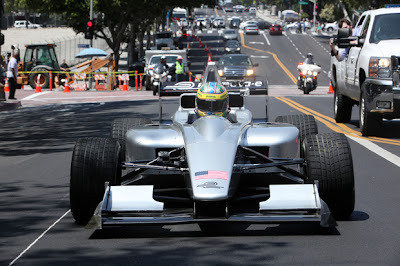 Formula E is an example. Their plan is to race on city streets in the center of major cities. Because they're using quieter race vehicles, they can do this without triggering noise complaints. What I've seen having attended several handfuls of electric races is that the action is just as exciting without the noise. With quieter race vehicles we aren't annoyed by all the racket from the machines. At all these races, I've met only a few people who truly demand that noise has to be part of racing. Most of those I've talked with mention the "eery" quietness of the race vehicles, but go on with appreciating the racing skill and the speed in front of them. 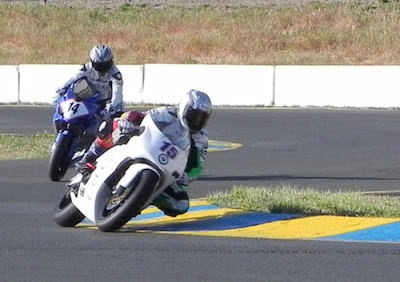 The only real "negative" I've seen is that electric race vehicles have a tendency to sneak up on you. You can be watching in one direction, and then get surprised when one of the vehicles suddenly pops into view because you didn't hear it coming. In my case that means I sometimes miss a picture. It's not like the vehicles are 100% silent, however. They're still making some noise just nowhere near as much. The tires are still crunching the road, and the chains or belts or gears in the drive train still make some noise, as will the controller and as well the vehicle itself as it pushes itself through the air. Stand next to the pit wall when one of these machines whooshes by at 150-170+ miles/hr, and it feels like the elemental force of the wind.